This dark chocolate cream pie made with bittersweet and unsweetened chocolate was carefully concocted to rely on less sugar than the typical chocolate cream pie of our childhood. A more adult-friendly and spectacularly satisfying rendition of a classic. 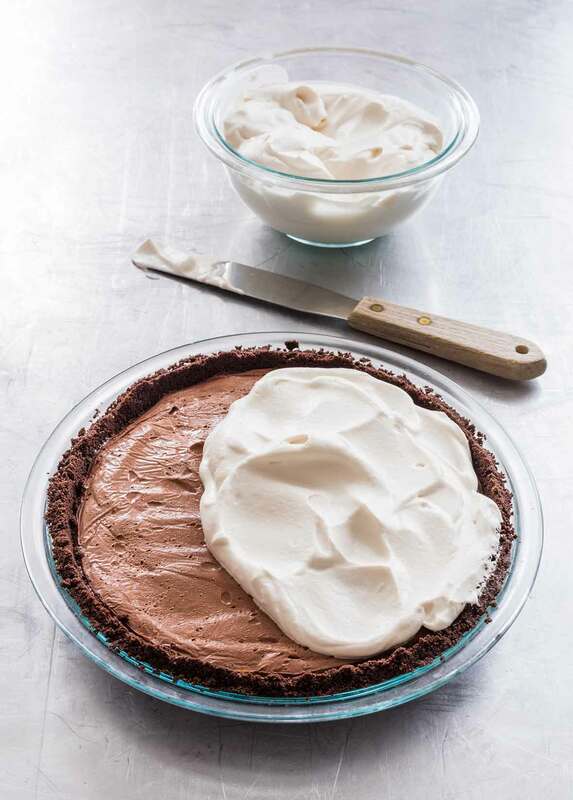 The knowledgeable folks at America’s Test Kitchen, who are the creative geniuses behind this dark chocolate cream pie recipe, divulged their favorite chocolates to use in this recipe. The best bittersweet chocolate, they say, is Ghirardelli 60% Cacao Bittersweet Chocolate Premium Baking Bar. Be aware that if you use a different brand, it may contain different amounts of sugar and, hence, affect the overall taste of the pie. Their preferred brand of unsweetened chocolate is Hershey’s Unsweetened Baking Bar. 1. Adjust the oven rack to middle position and heat oven to 325°F (163°C). 2. Process the graham crackers in a food processor to fine, even crumbs, 30 to 60 seconds. Scatter butter over top and pulse until mixture resemble coarse sand, 15 to 20 pulses. 3. Sprinkle the mixture into a 9-inch (23 cm) pie plate. Using the bottom of measuring cup, press crumbs firmly into even layer on bottom and sides of pie plate. Bake until the crust is fragrant and set, 15 to 20 minutes, rotating the pie plate once halfway through baking. Let the crust cool to room temperature, which should take about 30 minutes. 4. Whisk the egg yolks, sugar, and cornstarch in medium bowl until well combined. Bring the half-and-half and salt to a gentle simmer in medium saucepan over medium heat. Slowly whisk the warm 1/2 cup half-and-half mixture into the yolk mixture to temper it (this simply means you’re gradually adding the warm liquid to the eggs rather than dumping it in all at once, which ensures the eggs don’t curdle from the heat), and then slowly whisk the tempered yolk mixture into half-and-half mixture remaining in the pan. Return the pot to medium heat and cook, whisking constantly, until the mixture is thick and glossy, 2 to 3 minutes. Remove from the heat. 5. Whisk in the chilled butter, several pieces at a time, until completely incorporated. Then whisk in the bittersweet chocolate, unsweetened chocolate, and vanilla and keep whisking until the chocolate is melted, making sure to scrape the bottom and corners of the pan with rubber spatula. 6. Strain the pudding through a fine-mesh strainer into cooled pie crust. Place a sheet of plastic wrap directly on the surface of the pudding and refrigerate until firm, about 2 hours. 7. If using coconut sugar, grind it in a spice grinder until fine and powdery, about 1 minute. If using granulated sugar, do not grind it. Using a stand mixer fitted with whisk attachment, whip cream, sugar, vanilla, and salt on medium-low speed until foamy, about 1 minute. Increase the speed to high and whip until soft peaks form, 1 to 3 minutes. 8. Spread whipped cream over the pie. If desired, sprinkle with some bittersweet chocolate shavings made by pulling a vegetable peeler along a bar of chocolate you’ve stashed in the fridge. Slice and serve. Dark Chocolate Cream Pie Recipe © 2016 America's Test Kitchen. Photo © 2016 America's Test Kitchen. All rights reserved. All recipes and photos used with permission of the publisher. This recipe delivers everything that's promised in the description. It is a perfect, highly satisfying dessert for those who want or need to reduce their sugar intake. The richness of the chocolate, the creaminess of the pudding, and the use of chocolate graham crackers all serve to bring a level of decadence to the pie without the extra calories and carbs from sugar. The crust holds together perfectly when served. To make it even more visually appealing, a tablespoon or two of chocolate graham cracker crumbs or chocolate shavings sprinkled on the whipped cream topping will do the job. Hmmm … looks a whole like another America’s Test Kitchen recipe, just less sugar. Yes? Still, since we have more of a “cream” tooth than “sweet” tooth here and I know from experience how less sugar unleashes the flavor of the main ingredient (here, chocolate), this is my next pie for #PieDayFriday as soon as the stone fruits are gone. As always, love your work. Yes, Alanna! 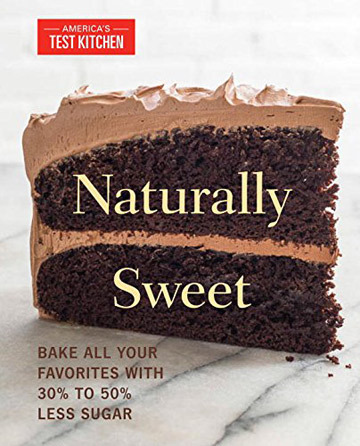 As you’ll see above, this recipe, too, is from America’s Test Kitchen but is found in their recent cookbook that’s dedicated to home cooks seeking to reduce their sugar intake without sacrificing their sweet tooth. It stands to reason they would base it on a previous recipe (that, incidentally, many folks have told us is the best chocolate cream pie they’ve ever experienced). Given what you said, I think you’ll really like this pie, which has a quite complex chocolate flavor from the reduced sugar, yes, but also the use of bittersweet and unsweetened chocolates in tandem. Love to hear what you think! And many thanks for your kind words. Can I freeze to travel to vacation pre-whipped cream? Yes, Mary, that should work fine. After you chill the pie (that is, the pudding in the crust) in the fridge as directed wrap it well and transfer it to the freezer. You’ll want to wait to whip the cream until you get to your vacation location for best results. Safe and spectacular travels! Diane, what a lovely memory!!!!!! You made our day, our week, our month! This is exactly why we do what we do. Food is about so much more than just…food. We so appreciate you taking the time to share this memory. Thank you.